Add some Lord of the Rings flair to your home! Did someone call for a Ringwraith? Ringwraith, anyone? 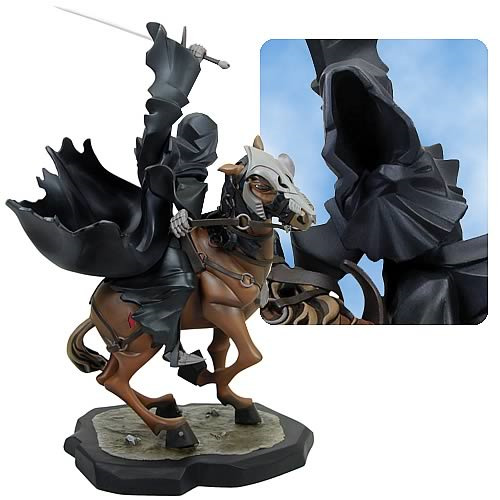 Based on the Lord of the Rings films but with a toon-inspired style, this dynamic polyresin statue of the malevolent and malicious Ringwraith on his horse would invoke terror throughout Middle-earth. The finely crafted sculpture stands 14-inches tall and will draw the eye of anyone who ventures near. Have you the courage to bring one into your home? Limited edition of 1,500 pieces. Ringwraiths are unbelievably nasty creatures of the twilight world. To most, they appear as black-robed figures on horseback. However, when wearing the One Ring, Frodo sees them in their true form: wretched husks of their former selves; tall, thin, and sapped of all mortality; pale, twisted masks of the will of Sauron. Nice, huh?